In all but four states, insurance companies can deny private Medigap insurance policies to seniors after their initial enrollment in Medicare because of a pre-existing medical condition, such as diabetes or heart disease, except under limited, qualifying circumstances, a Kaiser Family Foundation analysis finds. Medigap policies provide supplemental health insurance to help cover the deductibles and coinsurance for Medicare covered services. One in four people in traditional Medicare had a Medigap policy in 2015. 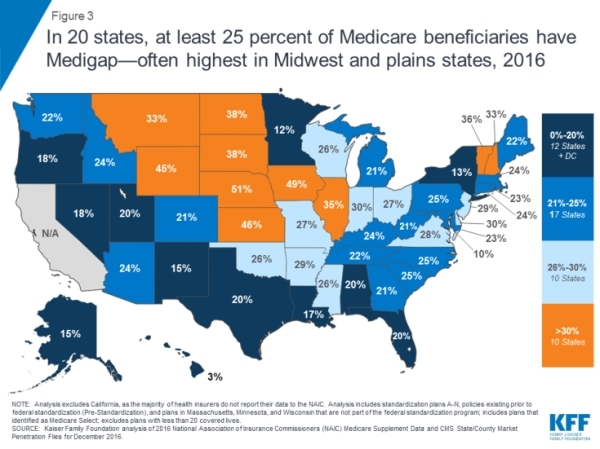 This new analysis of federal law and state regulations shows that only Connecticut, Maine, Massachusetts, and New York require Medigap insurers to sell policies to all Medicare beneficiaries ages 65 and older either continuously during the year or for at least one month per year. In all other states and the District of Columbia, insurers may deny a Medigap policy to seniors, except during their initial open enrollment period when they start on Medicare, or when applicants have other specified qualifying events, such as the loss of retiree health coverage. Depending on their state, Medicare beneficiaries who miss these windows of opportunity may unwittingly forgo the chance to purchase a Medigap policy later in life if their needs or priorities change, or if they choose to switch to traditional Medicare after several years of being in a Medicare Advantage plan. 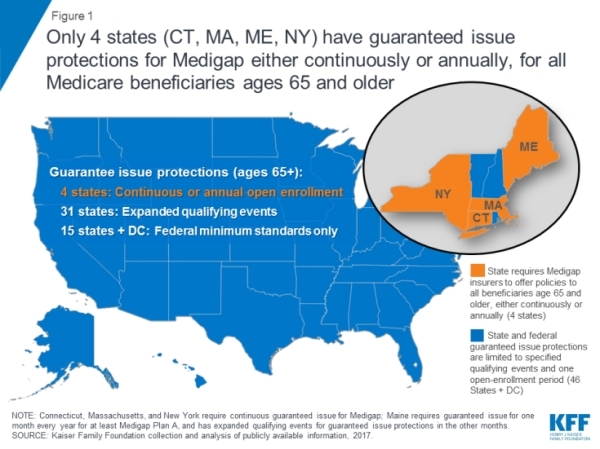 The brief provides new national and state-by-state data on Medigap enrollment, and describes federal and state-level consumer protections that can affect seniors’ access to Medigap. You can read the entire issue brief here.